Sensual and savage, Lorraine Broughton is the most elite spy in MI6, an agent who’s willing to use all of her lethal skills to stay alive during an impossible mission. With the Berlin Wall about to fall, she travels into the heart of the city to retrieve a priceless dossier and take down a ruthless espionage ring. Once there, she teams up with an embedded station chief to navigate her way through the deadliest game of spies. Atomic Blonde is a sleek, stylish action spy thriller based off the graphic novel The Coldest City. The film has Charlize Theron tackling the lead role of Lorraine Broughton, the feisty MI6 agent with James McAvoy lending a hand as James Percival, her main contact in Berlin. The marketing had sold the film as a “female John Wick” with director David Leitch previously directing John Wick with Chad Stahelski. In reality Atomic Blonde is much more a Bond film than a Wick film with how dense the story tries to be. At the core you’ll find a spy film with Theron’s Broughton being interrogated by an MI6 executive played by Toby Jones and a CIA agent played by John Goodman as she sets up each scene. The script itself is convoluted and hard to follow with the interrogation scene serving as a dull exposition dump while the events in Berlin are bogged down by too many location changes and too many underdeveloped characters. The story motivation itself has been seen many times as the “top secret list” containing the real identities of spies around the world is up for grabs. Here the fluid action set pieces and stylish portrayal of Berlin are enough to salvage a mediocre story. Much like John Wick, the film is glossy with vibrant colors littering the screen. 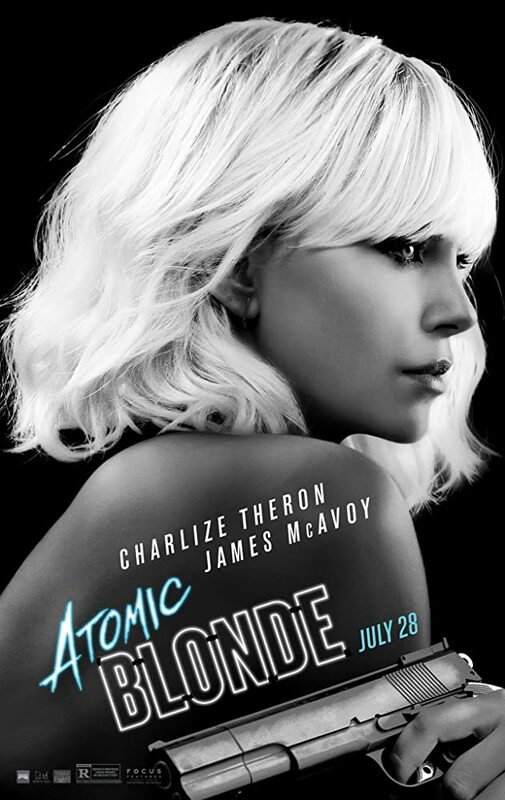 Atomic Blonde also features a ton of classic new wave pop songs that are incorporated well into the story, though it gets tiresome when the music is cued at the start of every other scene. Theron commits to the role by doing many of her own stunts which should be applauded with how precise the movements are in each action sequence. There’s one scene in particular which is an uncut seven minute take which consists of a back and forth fight on the stairs before a car chase ensues on the street outside the building. Often Atomic Blonde struggles to decide whether it should be a smart spy film or an action extraordinaire. What the Wick films have done so well is embrace the small story while showing relentless carnage on screen, Blonde is trying to juggle both and struggles to stick the landing. Charlize Theron continues to prove she’s a badass with rugged characters such as Furiosa in Mad Max: Fury Road, Cipher in this years Fate of the Furious ,and now Lorraine Broughton. What makes the stunts in this film unique compared to others is how they show the characters suffering from fatigue as they try to fight off one another. Often there is a break in the action while they try to catch their breath before finishing the job. Theron is able to pull off the stoic Broughton while still showing devilish charm. Regardless of the size of role, James McAvoy is always able to enhance a film with his presence. Here his character development is limited but he’s still able to leave an impression as he falls head over heels for Theron’s Broughton. His character, agent Percival is able to have the most fun and add some humor to a film with little levity. Both John Goodman and Toby Jones spend the majority of their time on screen behind a desk. Both of them are solid in what they’re being tasked with despite their scenes being used as a crutch to hold the story up. Thanks to a medley of fun pop songs, stimulating style, and bone crunching combat, Atomic Blonde is able to overcome a weak story. Though it doesn’t fully embrace what it’s trying to be, there’s enough entertainment to make it worth a trip to the theater. It doesn’t end up being as compelling as it wants to be and settles for a more than satisfying summer blockbuster viewers have grown accustom to.